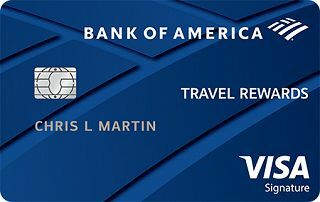 The Bank of America® Travel Rewards credit card gives Bank of America Preferred Rewards customers the opportunity to earn as high as an effective 2.625 points per dollar spent. Overall, that’s a great rate in our book. Keep in mind, to earn this high effective rate you need to have Platinum Honors status for Preferred Rewards. Platinum Honors status is $100,000 in a Bank of America® banking and/or Merrill Edge® and Merrill Lynch® investing and trading accounts. When traveling abroad, this is a good card to keep in your wallet since the foreign exchange fee is none. This saves you money since many cards charge a fee ranging from 1 to 3 percent of each transaction. This card has a decent rewards rate for non-banking cardholders, especially since there is a $0 annual fee. Though, if you want the highest rewards rate, be sure to check out other travel cards or cash back cards that offer higher rates in select purchases or overall. While it may not have the highest rewards rate on the market, the Bank of America® Travel Rewards credit card is a card to consider for current Bank of America Preferred Rewards customers. You can earn up to a 75% rewards bonus that makes this card worthwhile. There is also a good intro period, considering this is a travel rewards card. You can benefit from 0% Introductory APR on purchases for 12 billing cycles, after that 17.24% - 25.24% Variable APR applies. This allows you to pay off debt during a year without accruing interest. When compared to other travel rewards cards, the rewards rate for the Bank of America® Travel Rewards credit card is low. However, it’s noteworthy to point out that the rewards rate for this card is an overall good rate when taking other factors into consideration such as the $0 annual fee and flat-rate rewards on all spending. Other travel cards may incur an annual fee and/or only reward you a high rate in select travel categories. The Bank of America® Travel Rewards credit card doesn’t offer many noteable perks outside access to your FICO® Score for free, updated monthly. Checking your score is a great way to stay on top of your credit. To gain the most value from the Bank of America® Travel Rewards credit card, be sure to use it on all spending as you will earn a consistent rate on every purchases made. By using it on all spending, you can accumulate rewards at a faster rate compared to only using it on select purchases. 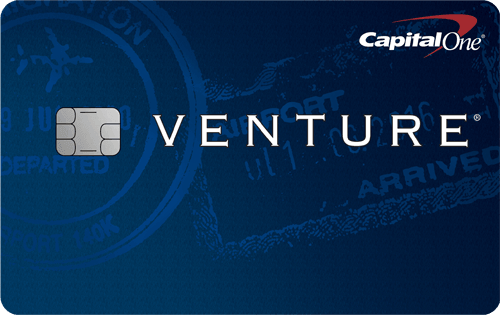 While many cards have foreign transaction fees, this card has none. Therefore, it’s a good card to use outside the U.S.
To increase your rewards meet the required spending for the online bonus points offer: 25,000 online bonus points after you make at least $1,000 in purchases in the first 90 days of account opening - that can be a $250 statement credit toward travel purchases. This card lets you earn 1.5 points per $1 spent on all purchases. That means whether you spend at a gas station, supermarket, department store or somewhere else, you will earn the same amount of points. You receive a 10% customer points bonus on every purchase when you have a Bank of America® checking or savings account. Those who are Bank of America Preferred Rewards customers can benefit from a larger bonus increase of 25% to 75%. Points can be redeemed in three ways: travel credit, cash reward, or gift card. Redeeming for a travel credit or cash reward starts at 2,500 points while gift card redemptions start at 3,125 points. If you choose a statement credit, it will be for travel expenses including purchases from qualifying merchants such as airlines, hotels, taxis, car rental agencies, tour operators and more. There is a 25,000 online bonus points after you make at least $1,000 in purchases in the first 90 days of account opening - that can be a $250 statement credit toward travel purchases. Note that you must complete your application online to qualify for this offer. The Bank of America® Travel Rewards credit card and the Citi® Double Cash Card – 18 month BT offer may seem like different cards (after all, one earns points and the other cash back), but they are nonetheless comparable. 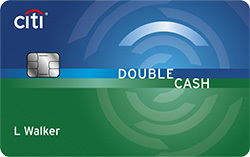 The Citi® Double Cash Card – 18 month BT offer lets you Earn 2% cash back on purchases: 1% when you buy plus 1% as you pay. This is a better rate than the Bank of America® Travel Rewards credit card, unless you’re a Preferred Rewards customer in the Platinum or Platinum Honors tiers. Both cards’ rewards can be redeemed for a statement credit, cash back or gift cards. But a key difference is you have more flexibility with the Citi® Double Cash Card – 18 month BT offer since the statement credit can be applied to all purchases; in contrast to the Bank of America® Travel Rewards credit card, which restricts your statement credit to eligible travel purchases. However, the Citi® Double Cash Card – 18 month BT offer charges a 3% foreign transaction fee while the Bank of America® Travel Rewards credit card has none. This makes the Bank of America® Travel Rewards credit card a better card for those who travel outside the U.S. and the Citi® Double Cash Card – 18 month BT offer best for travelers who remain in the U.S.
Balance Transfer Fee Either $10 or 3% of the amount of each transaction, whichever is greater. 3% of each balance transfer; $5 minimum. The Bank of America® Travel Rewards credit card is a great choice for Platinum or Platinum Honors Bank of America Preferred Rewards customers, since they will see the highest rewards rate. It’s also beneficial for people who travel abroad and want to avoid a foreign transaction fee.